Are Personal Trainers Like Creative Problem Solving Facilitators? Don’t Get Fat. Hire A Facilitator. I admit it. I have put on some weight. Some people call it the after-50 spread. I call it eating good food, enjoying wine and not having a regular exercise regime. This year, it was time to lose a few pounds and tune up my flexibility. 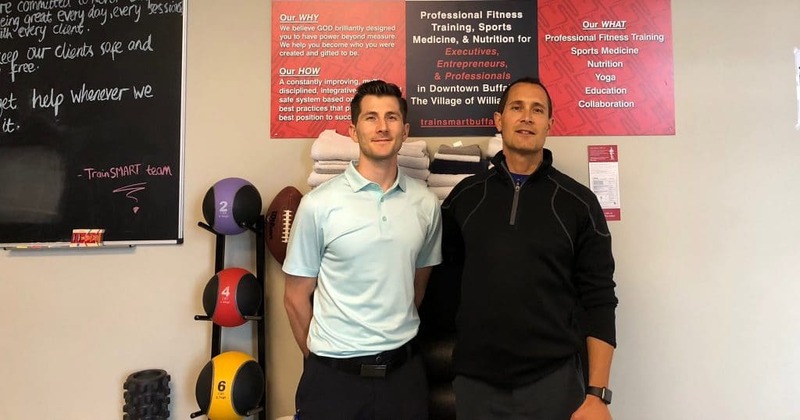 In February, I started working with Joe Fox and Brandon Mancuso of Train Smart Personal Fitness. I wanted to take off that weight and get rid of some of the aches and pains I was beginning to experience. My goal was not to get ripped abs like I had when I was 30 – ok, I didn’t have ripped abs when I was 30 – I wanted to slim down and feel better. Could I have taken off the weight and gotten into shape without a trainer? Probably, but not likely. I haven’t made much progress on my own so far. Joe and Brandon do a number of things for me. They show me how to exercise with proper form so that I don’t get hurt. They keep me on track so that my needs are met. They make sure that all of the conditions that I need to accomplish my goals are in place. They hold me accountable. My only job is to focus on doing my exercises correctly, following the fitness plan we have established and letting the process work. That’s it! Health and fitness trainers are a lot like Creative Problem Solving facilitators. Can you run effective Creative Problem Solving sessions consistently without someone managing the process and keeping the group on track? My experience is, no. A facilitator keeps the creative process moving, ensures that the needs of the client and the group are met, and knows the creative process inside and out. Good group facilitators make sure that participant ideas aren’t destroyed, and that the session produces results that work. A facilitator holds the team accountable to the process so that it can accomplish its goals instead of wasting time spinning its wheels. Just like a good trainer. In our book, Facilitation: A door to creative leadership, my co-authors and I list the qualities of an excellent Creative Problem Solving facilitator. If you look at the qualities of my fitness training team, you will see some striking similarities. Am I losing weight and feeling better? Yes, I am! If a good trainer can help me accomplish my fitness goals, an excellent facilitator can help you keep ahead of the competition and create breakthroughs that work. Facts on facilitators excerpted from: Facilitation: A door to creative leadership (5th ed.). Miller, Vehar, Firestien Thurber and Nielson. (2011) Facts on trainers taken from an interview with Joe Fox and Dr. Brandon Mancuso of Train Smart Fitness. Special thanks to Tiffany Yerico who originally made the connection between trainers and facilitators.